The Dri-Eaz DrizAir 1200 is a commercial dehumidifier that helps to reduce the humidity in enclosed structural environments by removing water vapor from the air. It has a max water removal rating of 18 gallons per day. When used properly, our commercial dehumidifiers can help dry wet materials like carpets, carpets pads, floors, walls, building contents, and more. 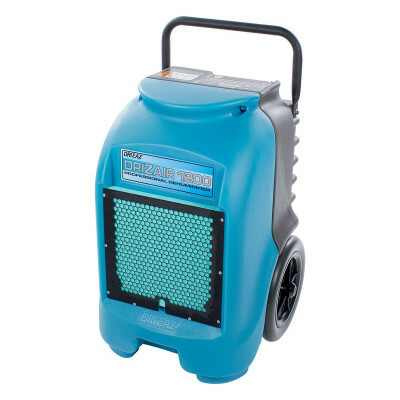 Using Dri-Eaz portable dehumidifiers may also prevent secondary damage caused by high humidity. This unit comes with a built-in air duct ring for easy attachment to expandable ducting. Depending on current electrical rates, you can run the F203-A DrizAir 1200 for a 24 hour period, and use approximately $1.50 worth of electricity for that entire 24 hour period. You should operate your Dri-Eaz portable dehumidifier in an enclosed area, as this creates a drying chamber. Close all doors, windows or areas that open to the outside to maximize the unit's water removal efficiency. Keep all traffic through the drying chamber to a minimum. Place the unit in the middle of the room, away from walls and doors. If you transport a dehumidifier in a horizontal position, set it upright for at least 30 minutes before you turn it on. This is necessary because when the machine is horizontal, the oil from the compressor flows into the refrigerant coils reducing the ability of the dehumidifier to function. Commercial lifetime warranty on the housing, 6 years on compressor & coils, and 1 year on parts. Customers who were interested in the Dri-Eaz® DrizAir® 1200 Portable Dehumidifier were also interested in the following items. This is a review for the Dri-Eaz® DrizAir® 1200 Portable Dehumidifier.